I am working on a very beautiful collaborative project at the moment. Called ‘Nests’, it’s a theatrical music installation that invites children aged 3-5 years of age to discover and explore a big range of very unusual, exotic percussion instruments from around the world, and draws them into musical interactions with each other and the adults around them. These explorations take place in gigantic nests that the children can enter and sit in. Nests is special to me for a number of reasons. One is because it is the first time I am getting to work with two artists I’ve admired for a long time, theatre designer Ken Evans and visual theatre director Rebecca Russell. We’ve been friends for a long time, and have always had many wonderful and inspiring conversations about making work with and for children, but this is the first time we have developed a project together. Another reason it is special is because the idea has grown quite slowly and organically for me over a period of time. 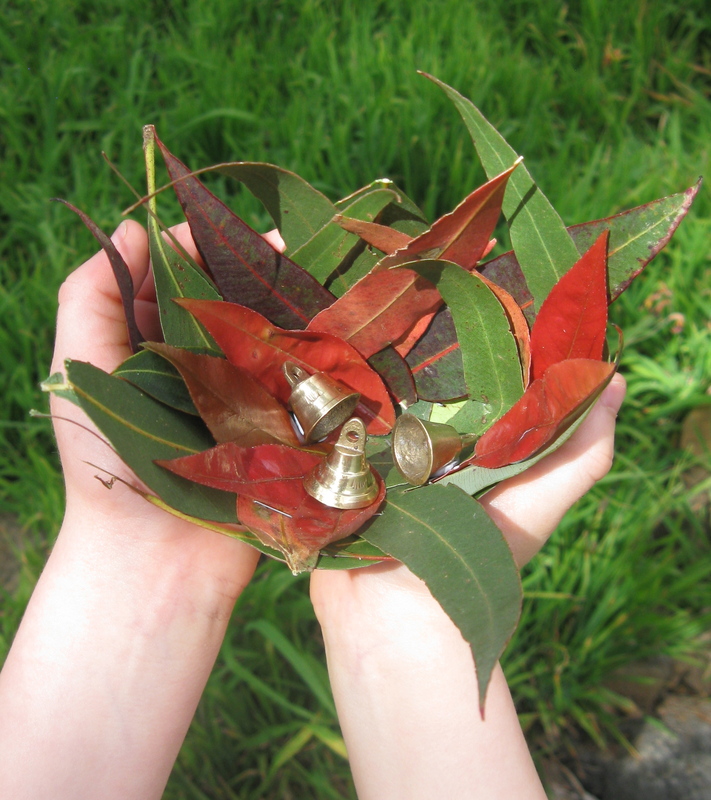 I first put musical instruments in nests in the jam for 0-5 year olds that I created for the Melbourne Symphony Orchestra’s Beethoven Festival in 2011 (I didn’t blog about that project at the time, sadly – had too many projects going on!). 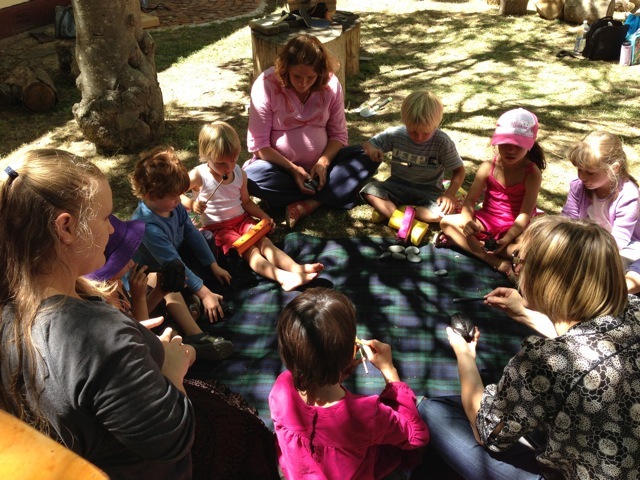 The idea of getting to sit in a nest really seemed to resonate with children and parents alike, and I kept it in the back of my mind, waiting for the right time to take it further. I knew Rebecca and Ken were the perfect artists to develop it with, and we developed the concept for ArtPlay’s New Ideas Lab pitching process back in July 2012 and were invited to develop and present Nests as an installation in 2013. We gave ourselves two specific challenges to explore with the project. One was that it be an installation, rather than a facilitated or led workshop experience. 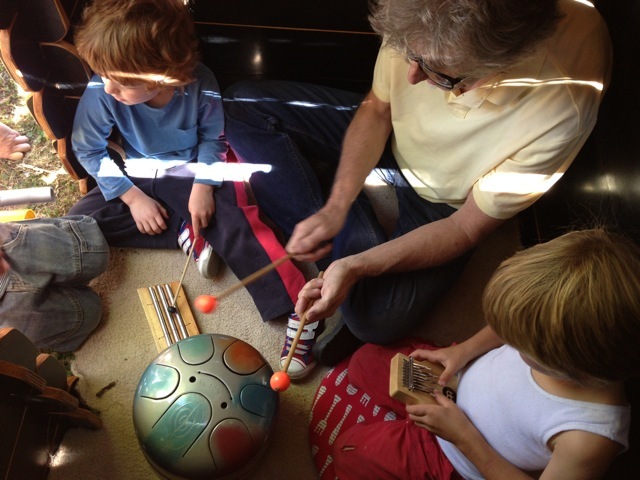 I love seeing children in this age group choosing their own ‘pathways’ through new experiences and learning through their own creative play, but this doesn’t often happen in music workshops, because children of this age often explore things quite independently and with instruments in hand this leads to very chaotic, noisy environments! Music experiences are therefore usually facilitated or led, and everyone is usually engaged in doing the same thing at the same time. For Nests, we wanted to create an environment (aural and physical) that would foster and draw on the children’s natural love of self-guided exploration, but that would also encourage them to listen and respond to each other’s musical sounds. The other challenge was to create an installation that could be packed up and used again. We’ve designed Nests to be portable, because we want to be able to tour it to other settings in Australia and beyond. So right from the start, Ken had the complex design challenge of working out how to build something that looked like a nest, was robust and sturdy enough to be climbed on and sat in by children, and that could be put together and packed up relatively quickly, and easily transported in the back of a standard car, and light-weight enough to take on a plane. We’re developing Nests in stages. The first stage was a 3-day creative development in December 2012. We spent a lot of time talking in the studio, but also ran an informal music exploration session at the Playscape in Creswick (in regional Victoria, Rebecca and Ken’s neck of the woods). This session with local children gave us the opportunity to see how they responded to the different instruments I’d started to gather, to see what most appealed to them, what didn’t hold their interest, and whether 3-5 year old fingers would be dextrous enough for some of the instruments I’d chosen. We learned that the more resonant instruments, such as the energy chime, thumb piano and gas bottle instrument you can see in the image above, really held the children’s attention. They played together for quite extended periods of time on these instruments and were very absorbed. And I was very happy to see that all of them could play the wah-wah tubes (which involves moving the thumb on and off a small hole in the metal tube) without difficulty. Instruments like the caxixi or the ‘waterfall’ (a bundle of tiny wooden bells that make a sweet, gurgling – but quite piercing for young ears – rattling sound) held very little interest. Short clacking sounds like the set of sprung castanet-like clackers that I bought in Vietnam were attractive but often put down quite quickly in order to play something else. At the end of the session we drew everyone together to sit in a circle and I brought out my collection of frog guiros. (I have 11 of them – I bought them in Thailand, one each day. I couldn’t resist them. Tony would say, “Gillian, I think you have enough frogs now” whenever the roving salesmen would approach us in the restaurant or on the beach, but I am very glad now that I ignored his comments and bought the frogs). We created a magical, almost meditative ‘frog bog’, listening to each of the frogs in turn and having frog conversations with each other. (They are all different sizes. I call the biggest frog ‘Big Nana’ because I didn’t want the biggest frog to be male, but I wanted it to be the frog that all the other frogs listened to. Nanas often have an important, loving authority in little people’s lives, and the children love expressing this authority with the Big Nana frog). We took the learning from that early exploration session into the next Nests phase, deciding on the sets of instruments to place in each nest, designing the environment and building a kind of narrative structure for the 30 minute installation experiences at ArtPlay. More on that in the next post. I have written about visual cues for ESL students in the past – using a metronome to encourage a sense of pulse and ensemble, and floor markings giving student reference points for organising themselves in the space. Floor markings also seem to assist students in letting go of physical anticipation/tension, and assume a more passive stance, which made a big difference when they were having a try of the violin for the first time. Today I have been working with SY, a wonderful early years educator and drama guru, who specialises in story-making. We are leading a 2-day Professional Development Seminar for primary classroom teachers. Today was Day One. SY taught a warm-up game that involves each person having their own little mat to carry and/or place on the floor. The mats are about 25x25cm, made of felt, and in bright colours. She uses the mats to organise a class, and keep control of their movement, all the while giving the children lots of choice and possibility. She starts almost every lesson with these mats, and they teach the children an important kinaesthetic and spoken vocabulary for movement and working in open spaces. Placing our mat on the floor and standing on it, ensuring we each had our own ‘personal space’ (measured by swinging our arms around our bodies like a helicopter, and checking we didn’t touch anyone else). SY: My students know exactly what is meant by ‘personal space’ and how to find it because we do this task so frequently. Walking away from our mat, but on a given cue (a drum beat) we had to run back to our own mat. Walking around the space carrying the mat – on heads/elbows/toes/noses, etc – and observing how this changed the way people used their bodies, and the beautiful, unusual shapes they created in the space. Placing our mats on the floor and had to assume different poses, within a given instruction from SY. A pose with your hands touching the floor; bottoms on the floor, but feet off; one hand and one foot only, touching the floor. Many of these are similar to theatre warm-ups used widely, but the addition of the mats offers ESL teachers a lovely way of organising students within a space without depending on detailed verbal instructions. The mats can help build a vocabulary with the students – both spoken and physical – for working with their bodies in open spaces. I bought new boots on the weekend. It took quite a lot of wandering up and down the streets, in and out of shops, trying on and pulling off. They are different in style to what I normally wear. CP gave a barely-discernible shudder when he saw them and said, “They’re a bit scary, aren’t they?” That was because they are pointy. For some reason CP immediately associated them with a swift (and scary) coup au zizi. So to speak. Hopefully I would never have any need to give such a coup. Yesterday I caught up with an old friend from Melbourne, SH, who lives near CP on the Ile-Saint Louis. We went for un chocolat chaud a l’ancienne in a fairly touristy cafe near her home (which is in the heart of tourist territory given that it has a gorgeous view of Notre Dame) with an unusually attentive waiter who took it upon himself to give her a hasty shoulder massage as he walked past us. We both raised our eyebrows at each other. “Does that often happen here?” I queried. No, she assured me. It doesn’t. Last night I went to the theatre. CP was performing in a remount of a play Etty Hillesum, in which he is one of four performers, playing violin (music he composed) as well as acting with some proudly delivered lines. It was all in French, but CP had given me a copy of the script in English to read beforehand. Despite that, it was hard to follow the dialogue. Afterwards, one of his friends asked me if I had enjoyed it. Yes, I had, I replied, but added honestly that I hadn’t really understood it. This was probably an ambitious thread to start. From now on my comments on the shows I’ve seen will be brief. This was a show I liked a lot. Kitson is an engaging performer, weaving stories and characters and setting the scene with skill in this one-man show about a man’s last day working in an archive of compilation tapes. The set was gorgeous – a tall set of shelves piled high with tapes, and a ladder on railings that could slide along the width of the shelving – which Kitson did with much grace. It was a heart-warming story too. At the close of the show Kitson reappeared to invite us to come to the stage in order to inspect the set more closely. The labels on all the tapes were intriguing and beguiling – suggesting love lost, hopes for rekindling, requests for forgiveness, tributes and revenge. Apparently the show tours no more after this Melbourne season, and the set will stay here. My favourite show in the Festival so far! The whole night had a touch of surreality about it, and this framed the show perfectly. The audience and their reactions to this piece (which starts with a darkened stage and a guy sitting at a sound desk down the front playing individual tracks from CDs, one after the other, with gaps in between while he took out one CD and put in the next) were part of the show. Very John Cage in that respect. Today was a half-day rehearsal with only the musicians in the Note to Self music & puppetry collaboration with children aged 9-12 years. It was a chance to review all the music we have written so far, and create one last piece of accompaniment.We also revisited an exploratory idea from yesterday and gave it more shape. We have a lot of content from these two days of workshops – six pieces of very structured, arranged music, and a seventh piece that is quite a free improvisation, governed by some simple rules. There is in fact a lot to remember – for all of us! We had to steam-roll through a bit today. Not quite enough time. TP was very active today, giving a lot of cues and feedback to the Ensemble. It was great to share the load in that way. As their confidence grows, and they become more familiar with the process, the children get quicker and quicker at responding to ideas. They use their ears more, and start to pick out notes and riffs as they are suggested. Some are following every conversation that takes place, (even if it doesn’t involve them), and working out new riffs as they are created – just in case they will be called upon to play them. I arrived at rehearsal with a very full head (I spent the morning drafting program notes for ‘Hunger’ so had not fully adjusted to the quick change of project), which got fuller as LL and I started a conversation about the Ensemble’s position in the space. I know there are reasons why it needs to be decided now, but part of me would like to get to that bit after we have had our rehearsal, so that I can let go of some of the music in my head to make space for information about stage moves. I really think multi-tasking is over-rated. It just causes great stress as your brain bounces about trying to keep everything on track. Today’s rehearsal for Hunger was hard work. There were tears… though they were mine, which is better than them being someone else’s. At least I know I can take care of me! Rehearsal time is tight. The music is set but still needing further rehearsal. Some of the cues are still being worked out. We have a lot of gear that we move from room to room. We need to be supportive of each other and work as a team, because everyone in this group is juggling a lot of projects and everyone is more fragile than they would like to be. I know I am worn out. I finished the Language School projects just yesterday. I am neglecting my Masters studies, which worries me. I have a 2-day project next week that I still need to fully plan. And then the week-long puppet extravaganza the following week. A total of just 4 days off (including weekends) for the whole school holidays. (I am an idiot, it must be said, for letting myself get so over-committed). I don’t mind the work time, – I am more stressed by the large number of projects and plans I need to have in my head. It means I need to find time to make a lot of plans, and because I have so many projects to realise, I need to make the plans really detailed, because there is not enough space in my brain to be beautifully, creatively responsive in the moment, or at least, to rely on that. I struggle therefore with planning time, and with support time, in which to speak with collaborators, meet with my Orchestra colleagues to sort out various logistic details before the next rehearsal, and just a bit of time for me, to relax and refresh before the next project. Don’t get me wrong about Hunger though. It is looking and feeling very strong. Every time the two companies come together in rehearsal to put the next scene on the floor, it feels very magical. And tickets are selling well – we are one of the Festival’s best sellers! That’s pretty exciting. Collaborations are never easy. I feel like we are still discovering (and learning) the best ways for these two companies to work together, how much to set, how much to score, what can be improvised and intuited, where there is space, how best to integrate the unique skills of all the performers… It is an incredibly ambitious and courageous project in this regard, and not without risk. I love being part of the creative team as we try to nut out the solutions to these questions, through the creation of beautiful, memorable, cheeky, anarchic content. But we need everyone in the company now to trust and commit to the show, and what it is, and what it can be. In a collaborative project, there are trust relationships on all levels, in all directions. I spend my Saturdays working with the fabulous, creative, generous artistic souls of rawcus and a small team of musicians from the Orchestra. We are working on a show called Hunger for this year’s Melbourne Festival, and this rehearsal period (Aug-Sept) has us in the home stretch of creating and locking in material. I’m thinking today about struggle and good art. The collaboration with the theatre company that the Orchestra’s outreach program is working with is one of the most challenging things I have done, artistically. It has hit a couple of snags recently. That’s mild language – in fact, in the last 8 days we have had two major dramas and each time, I feel myself sigh a bit more heavily inside. The director and I spoke today and vented some frustrations – not towards each other, but towards these snags (as I shall call them). Her more than me – I had the advantage of a couple of days’ stewing time, and a visit to the Japanese Bath House yesterday evening to help me calm down and take my mind off it all. We both agree it could well be an amazing show that we are in the middle of creating, and we both feel that in a way, these challenges that keep arising are part of that amazing-ness. They are the grit that is forcing us to keep digging away at the material that we devise, to be demanding of it, and challenge it. We need the musicians to feel this too though, and to keep trusting us.